We install industrial epoxy floors and polish concrete throughout the southeast. Call us now to learn how we can improve your flooring. We service industrial, manufacturing, aerospace, food & beverage processing, warehouse, hangars and automotive industries. Liquid Floors protects your investment in concrete flooring by installing on the best epoxy flooring products and utilizing the best concrete polishing services. Liquid Floors are your industrial epoxy flooring experts installing stunning urethane and epoxy floors that are durable, chemical resistant and gorgeous. 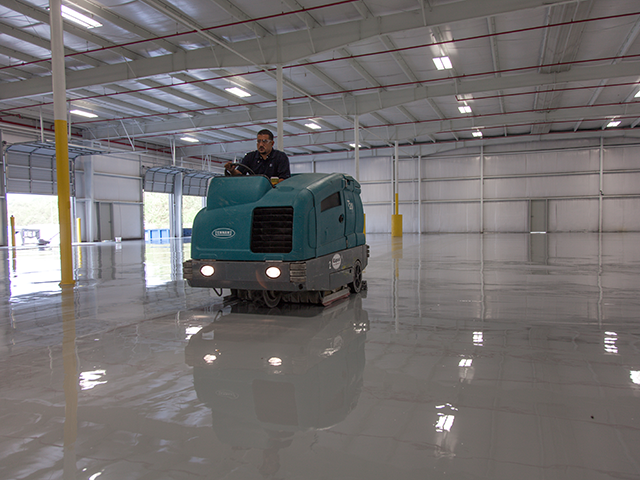 When you allow Liquid Floors to revolutionize your facility, you can be sure that we will provide you with an industrial level finish to your industrial floor. When we concrete polish your flooring, we first grind down the surface layer of concrete to remove any scars or blemishes. Then we utilize industrial grade chemicals to harden your floors making them incredibly durable and stain resistant. After a final polish, your floor is durable and stunning ready for use. Our techniques have been developed through decades of industry experience, and we keep a customer-first perspective in every job we do. At Liquid Floors, we will help you determine how best to preserve your concrete flooring and which methods or techniques we can use to deliver the best results. From our initial consultation, where we understand your needs and expectations, we will work closely with you to create a plan that satisfies your needs while working with your budget and schedule. Creating a more attractive and efficient space is made simple through urethane or epoxy floor coatings. Epoxy coatings are extremely durable and can be customized to meet a variety of requirements in terms of appearance and function. Light reflectivity can be increased up to 300 percent, reducing the need for and expense of additional lighting. For situations where coatings are not optimum, concrete polishing provides a similar result. Our concrete polishing techniques – culminating in the use of a 3,000-grit diamond – create beautiful concrete floors that are easy to maintain and simple to clean. To find out more about the benefits of our different flooring solutions or to learn more about our techniques – contact us today. …among other states. At Liquid Floors, we take pride in our work and do whatever it takes to leave every customer satisfied with a job well done.